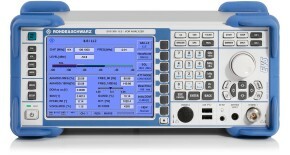 Its high measurement speed makes the R&S®EVS300 level and modulation analyzer ideal for reliable ILS runway measurements at maximum speed. 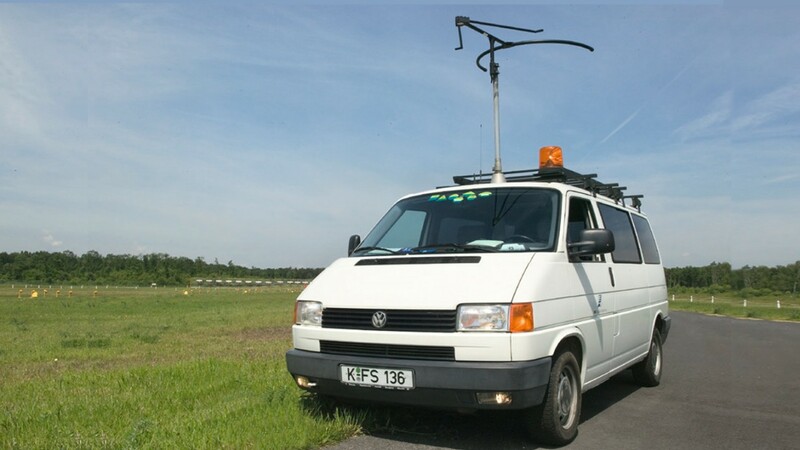 Measurement vehicle for verifying ILS stations. Instrument landing systems (ILS) assist aircraft pilots during the landing approach, especially when visibility is reduced due to bad weather conditions and at night. Different categories (CAT I, II, IIIa, IIIb) are specified depending on the runway visual range (RVR) and other criteria. ILS CAT III is the most demanding category, supporting approach and landing down to an RVR of 46 m (CAT IIIb). CAT III stations are typically installed at important international airports with high air traffic volume. Being subject to maximum safety requirements, the International Civil Aviation Organization (ICAO) standardized the critical parameters of ILS systems that need to be checked during ground and flight inspections. Providers and flight inspection organizations regularly monitor, control, calibrate and certify these landing systems to ensure accurate operation. ILS consists of two independent subsystems: The localizer (LLZ) provides lateral guidance; the glideslope (GS or GP) provides vertical guidance. 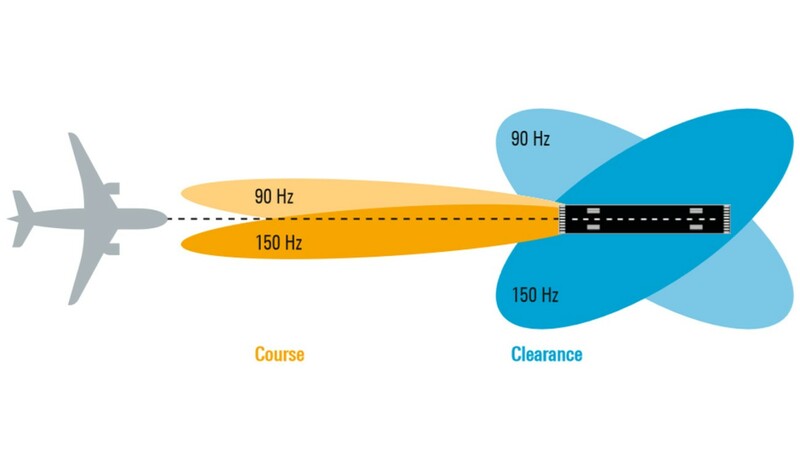 Two-frequency ILS systems (for CAT II and CAT III) have two carriers on each subsystem to separate course and clearance and to improve ILS coverage and precision at the same time. The runway (or axis) measurement of the LLZ is most critical since the ILS signal is measured along the centerline of the runway, leading to an interruption of the air traffic. To minimize such interruptions and perform measurements with accurate and reproducible results, you need an ILS test solution capable of performing reliable runway measurements at a vehicle speed of e.g. 60 km/h. 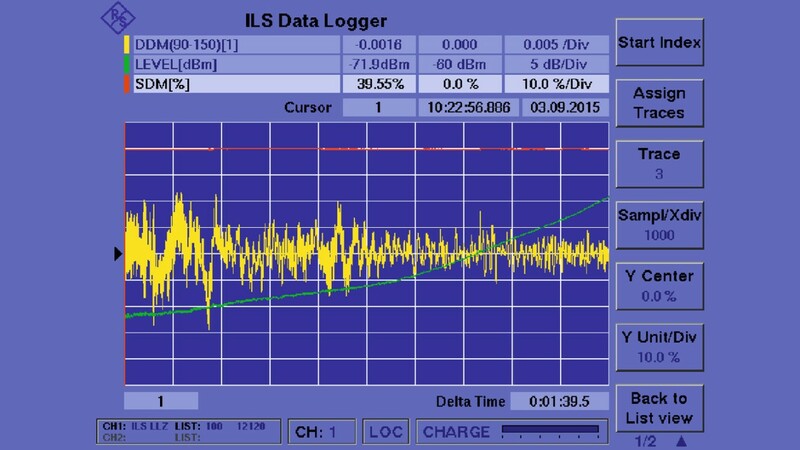 The R&S®EVS300 data logger (graph view) enables continuous monitoring during runway measurements. The R&S®EVS300 is a portable battery-powered level and modulation analyzer designed especially for verifying and maintaining navigation aid (NavAid) systems such as ILS, VOR and Marker Beacon. Its unrivalled speed of 100 measurements/s makes the R&S®EVS300 ideal for reliable ILS ground inspection including runway measurements at maximum speed to reduce air traffic interruptions to a minimum. At maximum vehicle speed the integrated data logger of the R&S®EVS300 is able to record an unrivalled amount of 100 datasets/s. 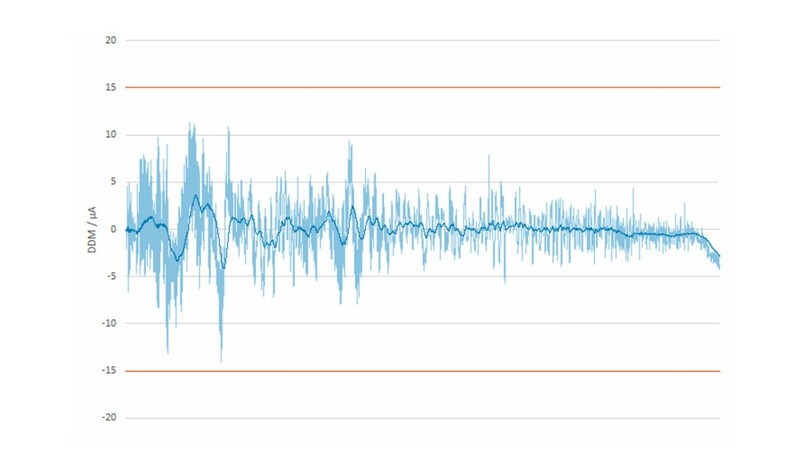 Each dataset consists of more than 50 different measurement parameters, including level, frequency, modulation and distortion values, ID parameters and GPS values (time and location) of the connected GPS receiver. The recorded data can be graphically displayed on the instrument (graph view) to monitor the selected parameters even during the runway measurement. Thus, you can immediately see, e.g. whether the measured difference in depth of modulation (DDM) of both LLZ IF tones is within the limits. All measurement data can be exported to a USB storage device in CSV format for further offline analysis (postprocessing), comparison with former measurements and archiving. Measured and ICAO filtered DDM values: The exported DDM course measurements show the “raw data” with typical scalloping effects (light blue) and indicate whether the ICAO filtered DDM values (dark blue) comply with the ICAO limits (red). For LLZ runway measurements, the evaluation of the DDM values (raw data) and their ICAO filtered values are most important. The ICAO filtering depends on the vehicle speed; Annex 10 Vol. 1 specifies a time constant (in seconds) of 92.6 divided by the vehicle speed (V in km/h) for ground and flight inspection. For a typical vehicle speed of 60 km/h, this leads to ~1.5 s.
In postprocessing (e.g. with MS Excel), the measured DDM values are filtered with the calculated time constant. This method easily proves whether the inspected ILS station operates within the specified ICAO limits. Comparisons with former runway measurements uncover even small changes in the typical DDM trace (fingerprint comparison) that could indicate an initial malfunction of the ILS system. The comprehensive functionality and unrivalled measurement speed of the R&S®EVS300 are ideal for the demanding regular ground inspections of LLZ and GS signals and particularly for vehicle-based ILS runway measurements of CAT II and CAT III systems. Supporting also newly emerging standards such as GBAS systems in one portable, battery-operated box, the R&S®EVS300 is the perfect tool for air traffic controllers and service technicians.